Lots of people are beginning to realise that they don’t have to live with a mossy or algae stained roof. In fact roof cleaning has been common place in Europe for many years. 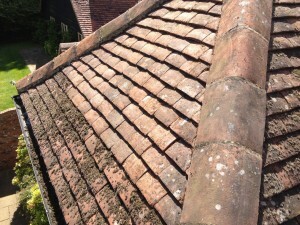 People are starting to discover they have a beautifully coloured roof hiding under all the years of grime and moss.Debris from trees and excessive moss growth can cause problems, Blocking gutters which can then lead to overflows, bubbling on paint, sagging gutters to damaged or water stained brickwork. The manual removal of moss is a very gentle alternative to abrasive pressure washing which can leave your tiles looking worn, brittle and sometimes discoloured. Pressure washing can strip the top protective layer of tiles leaving a rough surface which actually encourages moss to return quicker. We offer to either scape or wire brush your tiles to remove the moss. During our survey we will discuss both options with you while offering our recommendation based on your priorities. Older or Clay tile roofs are fragile and could be showing signs of distress especially where moss has been established for a long time. To complete a roof clean job of this nature requires more delicate work. Using specialist equipment means these jobs will be carried out safely without causing further damage, we will also replace existing broken tiles if required. 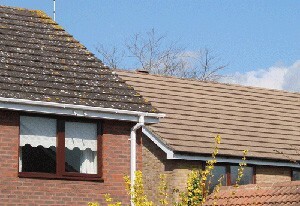 Do you have dull, dark or stained roof tiles? Lichen, moss or algae patches? We are your local contractors of Algoclear, the clever biocide agent that’s quick, 100% effective, long lasting and kind to your roof. It will bring back the lost colour of your roof while killing and removing traces of moss, algae leaving your roof looking and staying fresher and brighter. It’s used to compliment our moss removal service adding further protection against regrowth. “A few months ago you came and cleaned the roof and took away a great deal of moss. You said that the overall appearance would improve over time as the fungicide took full effect and the small bits of residual moss were washed away. You may have noticed that we have had some rain recently!